We have heard many tales of vacations gone bad, and the cause is usually other people: airline schedulers, hotel receptionists, Mickey Mouse, manic spouses, teen fiction authors and even poor travel planning by Hitler's high command. The only recourse vacationers can usually expect is a refund and a story to tell. Except for hunters. Their inconvenienced weekends can put people behind bars. Thanks to the deep pockets and fanatical advocacy of the National Rifle Association, every state has some sort of law that grants a special privilege to those who get their fix from yanking the antlers of a bleeding whitetail buck while the creature labors through its last breaths. Commonly called "interfering with a hunter," these laws constitute a crime of conscience that can lead to jail or even prison time for people who object to the notion that pumping God's creation full of lead is an acceptable hobby. By ironically claiming to be proponents of conservation, the NRA pushed these laws through in response to the work of activists trying to scare animals away from danger or otherwise obstructing a hunter from doing the deed. Even those who are sympathetic to hunting would likely expect this sort of act to be punishable only by fine or civil liability. And that is the case in some states. But in most states, this is considered a crime with the potential for incarceration. Numerous state laws include jail time ranging from maximums of 10 days to six months. Six states - California, Iowa, Michigan, Missouri, New Mexico and Oregon - top off at a full year. 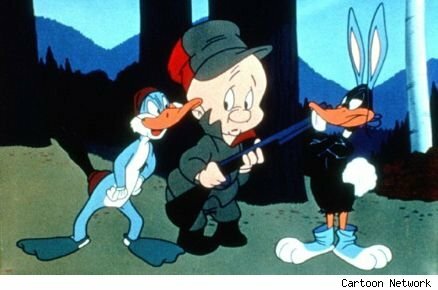 Bugs Bunny would be a felon in South Carolina. South Carolina provides the worst possible punishment for this act of civil disobedience, thanks to its harsh sentencing laws. A fourth offense is considered a Class F felony, punishable by up to 10 years in prison. The only silver lining is the sketchy enforcement of this law, as park rangers and forestry officials who entered their profession to protect wildlife often turn a blind eye. The NRA is aware of this and uses its standard tactic of claiming victimization, even referring to interference events as "horror stories." If you are still skeptical about the NRA's influence in government, look at its extensive contributions to political figures. Also note the source of this Colorado Parks and Wildlife guide to dealing with people interfering with hunters.